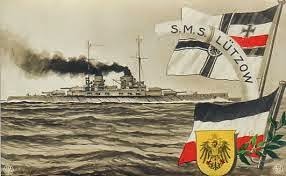 SMS Lutzow. She had a short service career and was scuttled as a result of damage received at Jutland 1916. As much for my own inspiration (or rather making sure I stay on track for a couple of weeks - at least until after my Pendraken order arrives!) as for any other reason I wanted to follow up on the mention of some painting in my previous post. I have a tray of based and undercoated WW1 1/2400th scale warships for both the Royal Navy and the High Seas Fleet . These were originally going to be used is but then with my one of my periodic flights of fancy I decided that hey would instead be gracing the fleets of both Fezia and Rusland. That has now passed and so the plan is now to use them as intended. The models closest to completion are a selection of battle cruisers and their escorting destroyers. For the Germans I have a pair of Derfflinger class battle cruisers whilst for the Royal Navy there is HMS Tiger and a pair of the Lion class. Each side has eight destroyers for escorts. The destroyers are at the 'funnel tops, boats and basing' stage whilst the capital ships need a little more work which was the object of the painting session of yesterday (which made a pleasant change from messing around with figure samples I can tell you - especially those being experimented with, some of which were truly horrible!). The main object was to tidy up the decking and I was able to do this with the result that, for the Germans and HMS Tiger at least, they are quite close being finished - the two Lions rather less so. As soon as this group are ready I plan to run a game (I should point out that I have light cruisers for each side already to go) based around a battle cruiser action using my dreadnought era adaptation of the Bob Cordery's Portable Naval Wargame. It will be nice to commission the above models in time for Easter which should be achievable as they are quite well advanced. The Pendraken stuff will remain in ite envelope until they are so that should be an incentive to finish them! I will look forward to seeing them in action on the table top seas. Me too! If you can find a copy "Sunk" has an interesting account of the loss of Lutzow (and sad other battleships) that may be of interest. Certainly I found it made me think again about WW1 rules etc. Have fun! So am I - the models are not bad and can be likened to 1/3000th scale models on steroids as far as detailing is concerned. I would certainly be interested in reading that. Finally got caught up on the blog. All your reflections and decisions seem good. I was going to suggest 6mm, but I think 10mm is good. I myself hemmed and hawed but landed upon 1/72 (20mm). Sometimes I wonder if I should switch to 15mm. I have also gone against my vow to never buy 28mm again. I look forward to your blog 2.0. Happy gaming! There are many reasons that sealed the deal and I took the time out to consider carefully the whys and wherefores. However, making the decision and translating it into a table top reality will be the next challenge!